Atlantic Division Champions for the 2017-18 season, the Lehigh Valley Phantoms (47-19-5-5, 104 pts., 0.684 pts., pct.) continue their quest for the 2018 Calder Cup Championship this weekend as they resume their best-of-five Atlantic Division Semifinals series with the Providence Bruins. 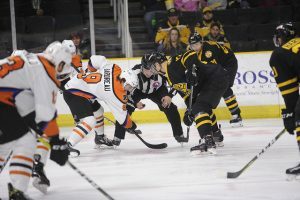 The Phantoms are coming off a split through the first two games, which both took place at Dunkin Donuts Center in Providence last weekend. Lehigh Valley opened the series with a 3-2 triumph on Friday before the Bruins leveled the best-of-five series at one game apiece thanks to a 5-3 victory on Saturday. Now the series shifts to PPL Center in downtown Allentown where it will remain until its conclusion. The tightly-contested series resumes this Friday, April 27 at 7:05 p.m. with Game 3 before Game 4 on Saturday, April 28 and, if needed, Game 5 on Monday, April 30. 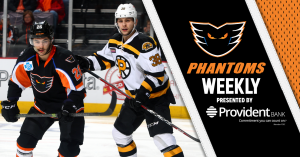 Be sure to secure your tickets today to experience the thrills and excitement of Phantoms playoff hockey at PPL Center by clicking HERE. Lehigh Valley’s Danick Martel (2 goals, 2 assists) and Providence’s Austin Czarnik (4 assists) lead all scorers with four points each through the first two games of the series. Phantoms’ forward Greg Carey has found the back of the net in each of the first two games of the series while Bruins’ forward Ryan Fitzgerald scored twice in Game 1 followed by Peter Cehlarik who tallied twice in Game 2. Lehigh Valley’s Alex Lyon has been razor sharp between the pipes through the first two games having allowed just six goals against while turning aside an impressive 70 of 76 shots (0.921 save percentage). 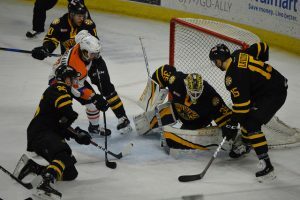 The Phantoms’ power play converted in each of the first two games and is currently ranked second among all playoff clubs at 37.5 percent (3-for-8). Meanwhile, Lehigh Valley’s penalty kill has thwarted eight of Providence’s first 10 man-advantage opportunities in the series. 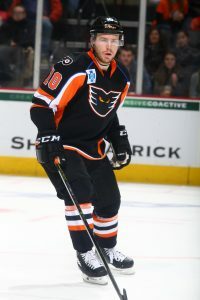 Forward Phil Varone finished the 2017-18 regular season first among all Phantoms and second among all AHL skaters in total scoring with 70 points. He established new career highs in goals (23), assists (47) and points and produced an impressive 15 multi-point games this year. For his efforts, Varone was named the Les Cunningham Award winner as AHL MVP and was also named to the AHL’s First All-Star Team. Forward Greg Carey (right) finished the season first among all Lehigh Valley skaters and tied for fourth among all AHLers with 31 goals. His 31 conversions established a new career high for the 28-year-old winger who became the first Phantoms player to net more than 30 goals since Jonathan Sim tallied 35 goals during the 2004-05 campaign. Forward Danick Martel finished the season second among all Phantoms with a career-high 25 goals. It was the third-year winger’s third straight 20-goal campaign as he’s now tied for ninth in Phantoms franchise history with 68 total goals. Forward Nic Aube-Kubel finished third among all Lehigh Valley skaters in total scoring with 46 points. He established new career highs in goals (18), assists (28) and points (46) and paced all Phantoms with 86 penalty minutes this season. Forward Mike Vecchione (right) led all Lehigh Valley rookies and finished tied for 15th among all first-year AHLers with 40 total points (17 goals, 23 assists). 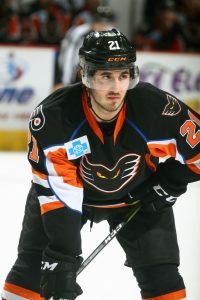 Vecchione tallied the most points by a Phantoms rookie since Erik Gustafsson recorded 49 points during the 2010-11 campaign. Defenseman T.J. Brennan paced all Lehigh Valley blueliners and finished fifth among all AHL defenders in total scoring with 45 points (14 goals, 31 assists). After another tremendous season, the ninth-year defenseman was named to the AHL’s Second All-Star Team and has now compiled 148 goals, 276 assists and 424 points across 582 career AHL games. Lehigh Valley went 42-1-5 when scoring three or more goals this season and 41-6-5 when allowing three goals against or fewer. The Phantoms were 30-4-6 when scoring first this season and 19-4-10 in one-goal contests this year. The Phantoms finished the 2017-18 regular season as the second-highest scoring team in the AHL averaging an impressive 3.42 goals per game. With 260 total goals this season, Lehigh Valley scored exactly as many goals as the team did a season ago when it paced the 30-team AHL in scoring. The Phantoms paced all AHL teams with a league-best 27 home wins in going an impressive 27-6-5 at PPL Center. Lehigh Valley closed the regular season on a seven-game home winning streak and produced a sensational 17-1-2 mark in downtown Allentown over its final 20 home outings. All told, the Phantoms outscored their opposition 140-98 at home. Meanwhile, Lehigh Valley was 20-13-5 on the road this year. 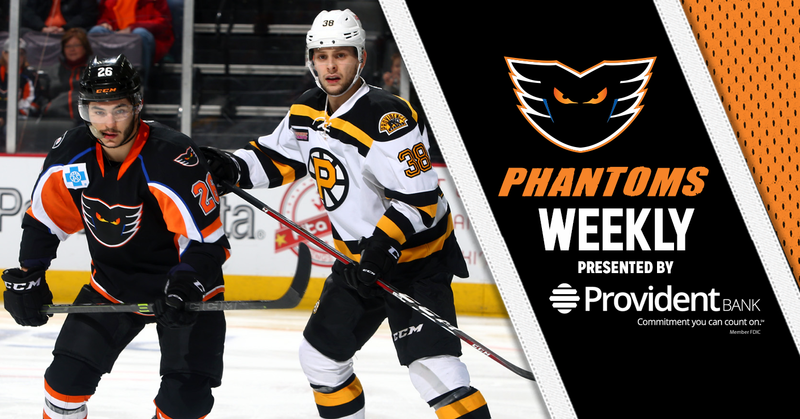 Danick Martel (1st, 2nd) scored twice and T.J. Brennan added a pair of assists as the Phantoms opened their best-of-five series with the Bruins with a 3-2 win in front of 4,418 fans inside Dunkin Donuts Center in Providence. Greg Carey (1st) also found the back of the net as Lehigh Valley turned in an impressive 2-for-5 performance on the power play in earning the team’s third straight road playoff victory. Alex Lyon earned the win in goal after turning aside 39 of Providence’s 41 total shots, including each of the Bruins’ 15 shots on goal in the third period. Ryan Fitzgerald (1st, 2nd) scored both goals for Providence while Austin Czarnik, the Bruins’ leading scorer during the regular season, added a pair of assists. Greg Carey (2nd) buried his second goal in as many games and Mike Vecchione notched a goal and an assist but it wasn’t enough as the Providence Bruins were able to level their best-of-five series with a 5-3 win in front of 4,583 fans inside Dunkin Donuts Center in Providence. Mark Friedman (1st) also found the back of the net for Lehigh Valley in front of goaltender Alex Lyon who turned in another strong performance between the pipes as he answered 31 of 35 shots. Forward Danick Martel chipped in a pair of assists as he recorded his second multi-point outing of the series. Peter Cehlarik (1st, 2nd) scored twice for Providence while Austin Czarnik chipped in another two assists in the winning effort. Anton Blidh, Jakob Forsbacka Karlsson and Jordan Szwarz also scored for the Bruins in front of All-Star goaltender Jordan Binnington who earned the victory in goal with a 23-save performance.